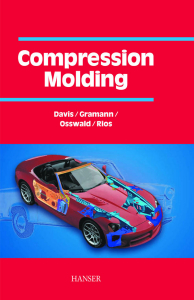 Author: Davis, B., Gramann, P., Rios, A., Osswald, T.
This book not only covers the advantages and disadvantages of molding operations with SMC/ BMC (thermosetting) and GMT/ LFT (thermoplastic) materials but also provides the reader with relatively simple models for monitoring, troubleshooting, and quality control of their process. Also covered is the important role of fiber reinforcement—how the quantity, length and fiber orientation influence part strength and stiffness. 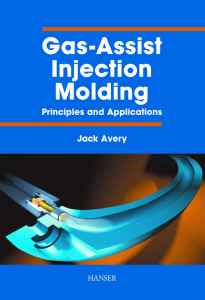 This book provides in-depth coverage of all aspects of designing, developing, and manufacturing parts using gas-assist injection molding, comparing this relatively new technology to other possible manufacturing methods. The reader will gain an under-standing of how to identify the specific version of this technology best suited for their application, as well as design and tooling details required to optimize cost and performance. This indispensable manual focuses on heat-treating by ASM, SME, and AISI standards. It has been created for use in student education, as well as to guide professionals who have been heat treating their entire lives. Written without the typical metallurgical jargon, it will serve as a training manual from day one in learning how to heat treat a metal, and then also serve as a day-to-day reference for a lifetime. This manual zeros in on the popular tool steels, alloy steels, heat-treatable stainless steels, case hardening steels, and more. It deals with these metals with up-to-date usage and processing recipes. What is different with this manual from all the others is that it doesn’t just deal with the heat-treatment process, it also covers the continuation of the hardening process with cryogenics. It is written to help those who may want a thorough understanding of what goes on in the process of heat-treating and how to do it better. It also shows how proper heat and cryogenic processing can save your company money through longer life tooling, decarb-free and stress relief, all while learning how to create a better, finer grain structure. This manual shows that hardness is only an indication of hardness, and that the real money savings is in the fine grained structure. Written for toolmakers, engineers, heat-treaters, procurement, management personnel, and anyone else who is involved in metals, this manual covers the complete range of thermally treated metals from 2400°F down to –320°F. During his career in the metals industry, Bill has presented over 290 down-to-earth seminars to train heat-treaters, engineers, and metallurgists. All of his seminars and books are written in everyday language, without the metallurgical jargon, that real people can grasp. Bill was heavily involved with metallurgy for a Fortune 500 printing-press manufacturer and then did metal consultation for specialty steel producers before opening his own cryogenic processing company. Throughout his career, Bill has tried to aid and assist anyone around the world with heat-treating problems. His goal is to help everyone to understand the benefits of looking at the complete thermal processing to save time, labor, wasted resources, and--most of all--money.